A real-time GPS network is widely used by companies that need to follow the whereabouts of things like telephone poles. Every modern nation has one. Japan's real-time GPS network has more than a thousand stations. Starting around 15 years ago, scientists imagined using that network to detect earthquakesnot the shaking itself, but the permanent changes in the ground's vertical and horizontal position. The giant Tohoku earthquake of 2011 was an important test for that line of research. That quake brought out a major shortcoming of Japan's existing earthquake early warning system, which relies on seismometers: the quake was too large and complex for the system to handle. The shaking alerts assumed that the quake was no larger than magnitude 8, but in fact at magnitude 9 it had 10 times more ground motion. The quake's true size was not known for hours, and while the alert system saved many lives by giving warnings of up to 60 seconds, it could have done much better for very large events. The Japanese real-time GPS network offered an alternative, independent way to monitor the giant quake as it happened. 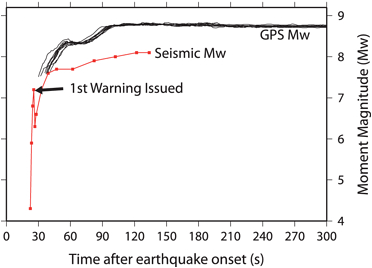 Studies of the GPS records showed that it could have been used to characterize the earthquake, both more accurately and much faster. Researchers at UC Berkeley have been working for the last few years on a real-time GPS system that can actually function. This year they placed their experimental system into working (operational) status by connecting it to California's ShakeAlertthe program that will become the foundation of the state's pioneering early warning system. Within days, it captured the South Napa earthquake. Although at magnitude 6, that quake wasn't big enough to make trouble for the seismometer-based network, it was a gratifying test. UC Berkeley's operational real-time GPS algorithm, called G-larmS, was developed by postdoc researcher Ronni Grapenthin (now at New Mexico Institute of Mining and Technology). He and his coworkers reported details this week in the Journal of Geophysical Research. It's a fast-and-dirty program specifically tuned to the Bay Area's earthquake faults with a lot of simplifying assumptions. But as tested on simulations of a large Hayward Fault earthquake and on real GPS data from the 2012 El Mayor-Cucapah earthquake, it works pretty well so far. The paper does not include the results from the Napa quake, but Grapenthin's group has another paper coming out soon covering that event in detail. Meanwhile, you can see Grapenthin's talk from last month's Third Earthquake Early Warning Conference in which he discusses the Napa results. 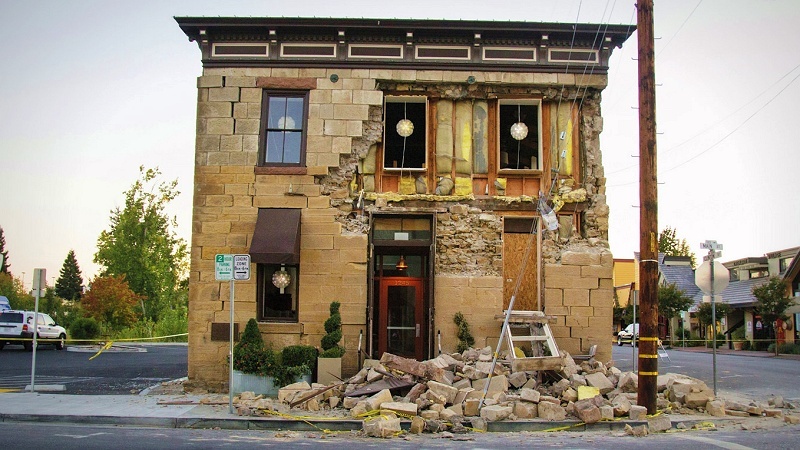 G-larmS, he says, could have sized up the Napa quake accurately in just 14 seconds. If this kind of success can be repeated for a much larger quake of, say, magnitude 7.5, it could make differences in the instant warnings and in the immediate actions of emergency responders. This is not the only real-time GPS research effort going on in this country. A team at Central Washington University has been working for the last 10 years with real-time GPS at the Pacific Northwest Geodetic Array or PANGA. That part of the world is prone to magnitude 9 earthquakes too, and the stakes are high.